The Ceramill Customer Center is an online service portal that we provide for our customers to facilitate permanently smooth operation with our products and systems – easy, self-explanatory and clear. 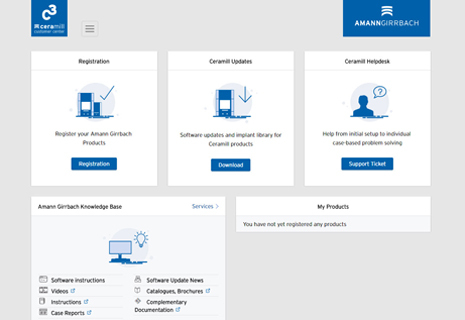 All relevant information, current software updates and comprehensive service functions covering all Amann Girrbach products are available with a single log-in. C3 has been developed in a completely new technical software environment. This environment enables us in the future to provide our customers with many new enhanced functions for the daily operation of the laboratory in parallel to the core functions (registration, activation, updates, M-Center). M-Center order processing is also displayed in C3. The C3 portal therefore replaces the Ceramill M-Center page. What are the functions of the C3 portal?